I can't help promoting this new re-issue as it captures some of Masekela's finest "pop" moments from the late sixties. Another LP worth checking out is the Ngubani LP by Jonas Gwangwa and African Explosion. Also issued in 1968 was an LP from which todays song comes from - "Hugh Masekela presents Africa 68". 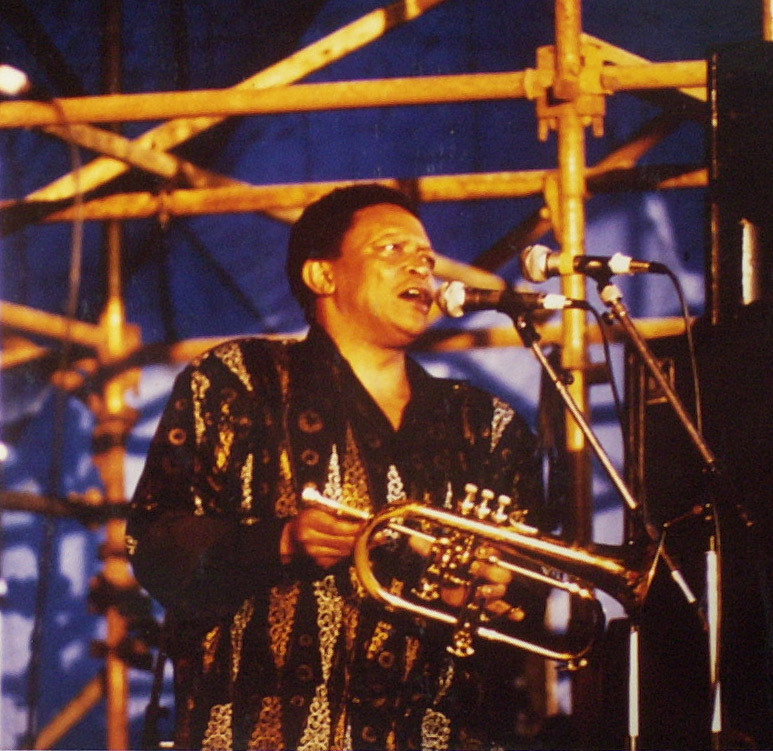 The music from this period reflects an ernest attempt to emulate the mbaqanga sounds coming from South Africa but with the obvious jazz-tinged arrangements that Gwangwa and Masekela are known for. Also look out for the LP The Union of South Africa. I have been lucky to see Hugh playing live a number of times, both in Africa (Botswana 1982, Johannesburg 1992) and in the UK (Womad 1986, London 1988). The picture below I took at Womad. "When I went to the US in the 1960s, it wasn't as an African musician. I wanted to be an American bebopper - my ambition was to play in Art Blakey's Jazz Messengers. But then Miles Davies and Louis Armstrong and the others said to me, "If you play only American jazz, you'll just be a statistic. If you play something of your own music, then we'll learn from you as well as you from us." That's when I discovered what musical migration meant. It made me realise I should know more about the traditional music of my country. Singers such as Miriam Makeba and Harry Belafonte helped me begin to discover my roots. Miriam's mother was a traditional healer and she knew everything about the music of South Africa. Even now the process still goes on when I go home and share what I've learned over the years, and in turn learn more myself about things that maybe I didn't pay enough attention to when I was young." 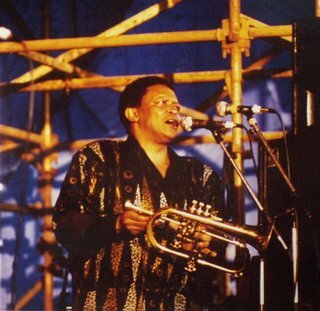 Doug Payne's site is a great reference for Masekela.